HAPPY FRIDAY! 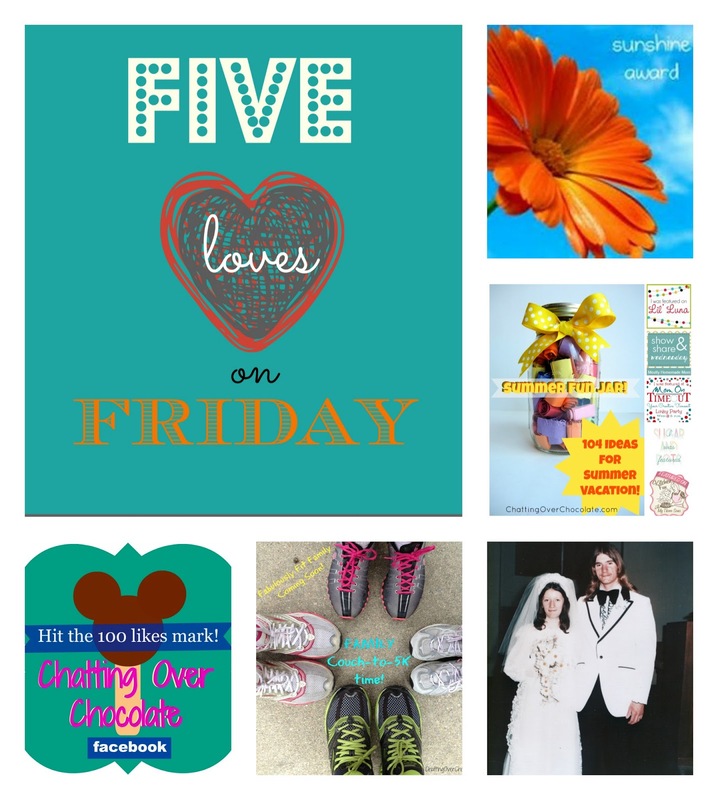 (aka: Five Loves time!) I'm so glad you stopped by today! I'm excited to share 5 of my favorite parts of the past week, with you all! 1. 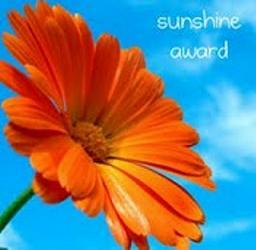 I received a Sunshine Award! Lizy from Just Dip It In Chocolate passed along this sweet honor to me. It was such a fun surprise and a great excuse to share a little more about myself with you all, as well as an opportunity to recognize some blogs/bloggers that "brighten" my days! If you missed the post, you can find it HERE. If you've already read it you'll know that 5 is my favorite number and guess what? . . .
2. I was featured 5x this week! SO FUN! 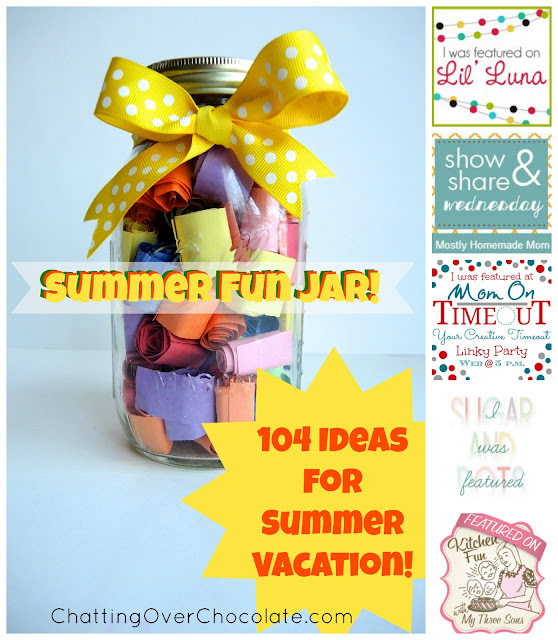 Thanks again, Kristyn of Lil' Luna, Kelly of Mostly Homemade Mom, Trish of Mom on Timeout, Kimmie of Sugar and Dots, & Jill of Kitchen Fun with my 3 Sons, for featuring my 104 Days of Summer Vacation post! 3. 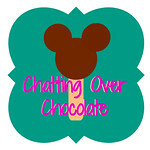 Chatting Over Chocolate hit the 100 "likes" mark on Facebook! I cannot say enough good things about the Couch-to-5K program! My hubby and I used it back in the Summer of 2011 and it took me from loathing running to loving it! However, I've let myself get a bit out of shape lately. (See my personal challenge to change that!) 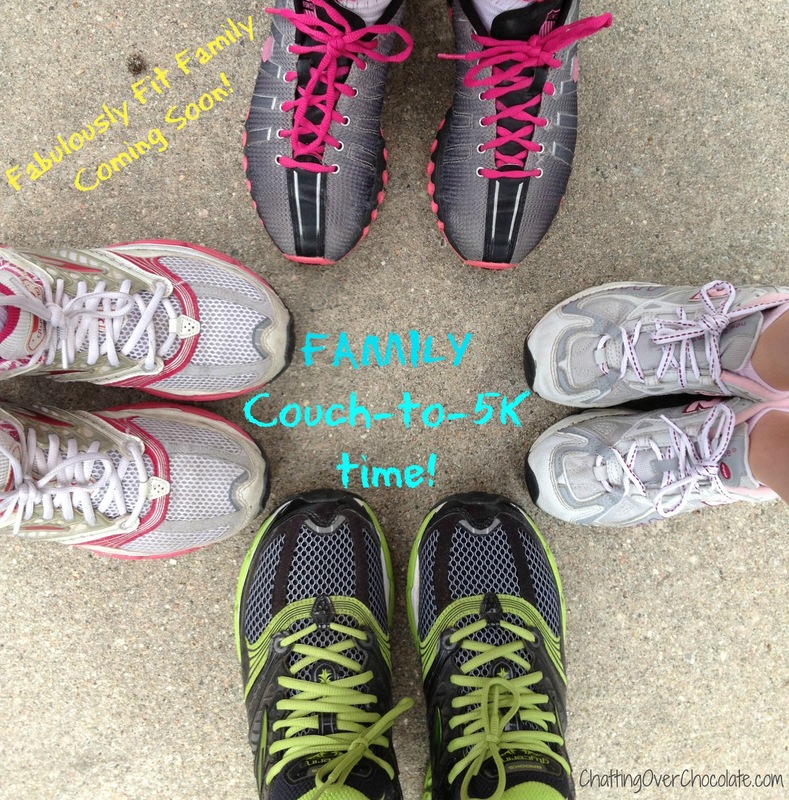 Last weekend we started doing Couch-to-5K together as a family! The girls thought it was such fun! It's going to be a great, active Summer! 5. The happiest occasion of the week is one that I wouldn't be here without! 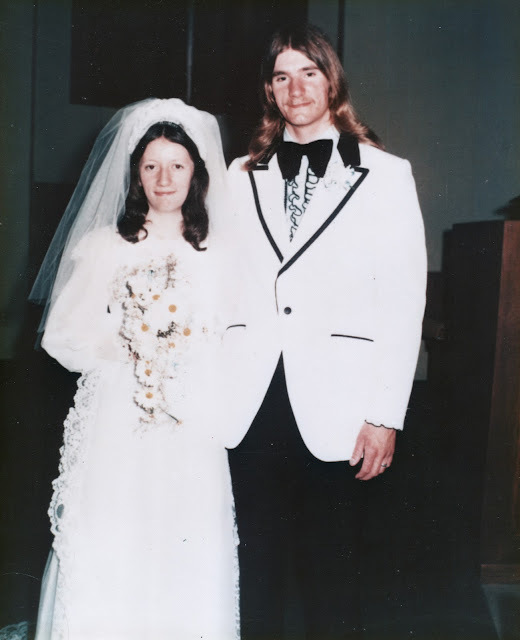 Tuesday was the 37th Anniversary of the day my parents were married! They met on a blind date in High School and have been together ever since! My dad was two grades ahead of my mom, but she couldn't bare the thought of waiting that long to marry him. Her solution? She took extra classes in night school enabling her to graduate at the end of her Junior year. They married 11 days after her graduation. They are just as in love now, and are best friends! I love you, Mom and Dad! Congrats! Hope you all enjoy a fabulous weekend!